Ivystone Senior Living is a centrally located community providing assisted living for seniors in Pennsauken, NJ. For seniors looking for quality care and active social engagement, Pennsauken offers a unique approach to assisted living. New Jersey residents have come to know Ivystone Senior Living for our customized care programs, amenities, and services. Through our holistic approach to assisted living and senior care, we take pride in knowing our residents are given a sense of belonging and their families peace of mind. 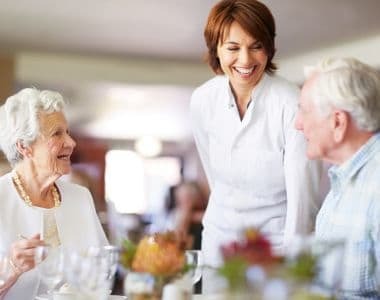 Our personal senior care staff provides assistance with Activities of Daily Living (ADLs) including dressing, bathing, evening care, and escorts to meals and activities—and more. Our goal is foster independence whenever possible, by providing as much—or as little—support as needed. We do all this with a focus on treating our residents with dignity and respect. Providing high-quality assisted living for seniors is our passion and our mission. A variety of luxury senior apartment suite options are available to residents calling Ivystone Senior Living home. In our spacious dining room with a formal fireplace, residents enjoy three nutritious meals daily, cooked home-style for flavor and served restaurant-style for our diners’ convenience. Wait staff take care of everything, including ensuring that dietary restrictions are followed. Ivystone Senior Living ensures that residents are as active as they want to be, while providing spaces for quiet socializing and private contemplation. Every day, we will be living fully, creating joyously, and experiencing a rich mix of art and culture, learning, and entertainment. Personal care services are offered on-demand and discreetly in accordance with each resident’s individualized wellness plan. Our nursing team at Ivystone Senior Living oversees each resident’s medication management program to ensure that medications are taken as prescribed by their physician. Residents can also be visited by third-party medical specialists to get the ongoing care they need.